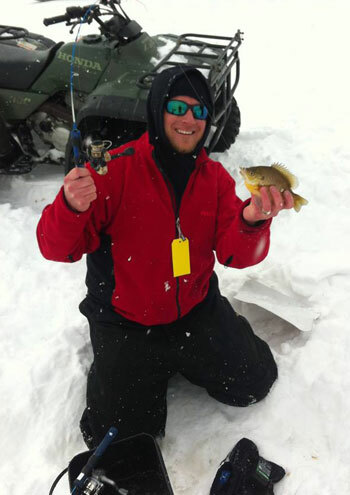 One of the Ludington area's best ice fishing spots is Hamlin Lake. The lake is more than 12 miles long and 5,000 acres large. As the cold temperatures remain constant, small fishing shanties dot the surface of the lake. 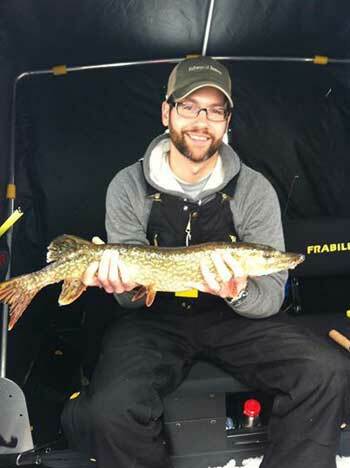 Hamlin Lake offers a variety of good fishing spots, depending on the methods you prefer. Dave Mahannah, former owner of North Bayou Resort, says there are many good spots. "Jig fishing for walleye occurs on the drop off of the North Bayou north towards the narrows and in front of the dunes." He says the edge of the drop off of the channel coming out of the narrows in Upper Hamlin Lake is also a good spot for walleye. "Small jig fishing for bluegill occurs primarily on Upper Hamlin Lake north and northeast of Wilson Hill Park boat launch," he says. "The South Bayou is also a spot fished for bluegill." Mahannah says crappie fishing at night occurs primarily from late January through February on the drop offs at the north and south sides of Upper Hamlin Lake. Mahannah prefers the tip-up method of fishing, also known as jigging, compared to spearing, "primarily because there is no such thing as spear and release. Some fishermen see spearing as an advantage because the fisherman remains in a heated shanty next to the hole. Plus, there are no worries of breaking a line." According to Mahannah, the disadvantages include not being able to cover a large area, and sitting in a dark shanty because of the need for darkness to see in the hole.